Description of "Valmiki Ramayan Simplified Part 2"
Nobody knows the origin of the God. Similarly, it is not possible to date the origin of Sanatana Dharma, which is popularly called as Hinduism nowadays. Sanatana Dharma is not merely a religion; it is much more than that; it is the way of life and provides entire worldview. The ideas of Hinduism are present in the form of Vedas, Puranas, epics and various other texts. 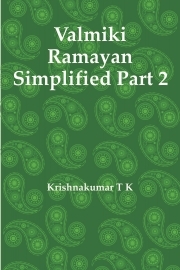 Valmiki Ramayan Simplified Part 2 is the second book in the series of books on Indian Mythology that the author has written. Ramayan is one of the two great epics of Hinduism. It was written by the great sage Valmiki. This book is not a retelling of Valmiki Ramayan. In this book, the author attempts to summarize the epic and simplify the ideas along with his observations. Krishnakumar T K, who prefers to be called as KK, is an Indian author. He has written travel guides, short stories and a lot of travel articles. This is his second book on Indian mythology. The author is planning to write series of books on the same subject. Reviews of "Valmiki Ramayan Simplified Part 2"